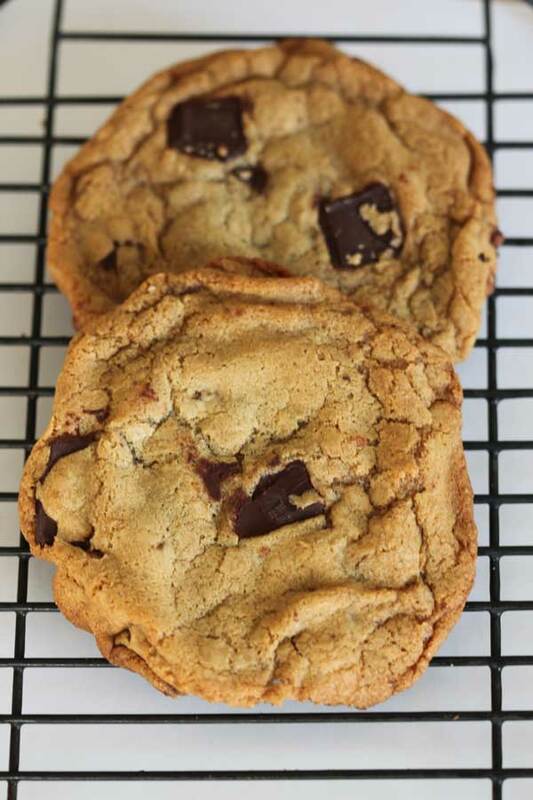 Big Flat Crinkly Chocolate Chunk Cookies are made with browned butter, two kinds of browned sugar and lots of good chocolate! Sorry the measurements are only in grams, but volume varies too much to really be accurate. Brown the butter and put it in a separate container to cool. Let cool completely. Meanwhile, mix together the flour and the baking soda. In a mixing bowl, combine all sugars, the egg, vanilla and salt. Add half the flour mixture, then add the cooled butter and stir it slightly. Add remaining flour mixture and stir until blended. Stir in chopped chocolate. Divide dough into 6 portions, keeping the tops scraggly. Chill portioned dough until firm enough to handle, then shape into neat balls and press the balls into 3 inch disks. Arrange 3 disks on a large, parchment lined baking sheet. Put in a 350 degree oven, then reduce heat to 325 and bake for 15 to 18 minutes or until done they appear just set. About halfway through baking, open the oven door and nudge the edges of the spreading cookies inward. Continue baking until they appear set. Let cool for about 5 minutes on the baking sheet, then transfer to a wire rack and let cool completely.